I'm getting an error asking me to change to the 96ppp before using this software, it doesn't say what to change or anything, so I'm pretty lost on that. I'm running Windows 7, could that be why? Yes, it's enough; also you need a driver (WinRing0 for example) and a system for make some test by yourself. Thank you for the answer, FELIX. I'm busy on something else recently. I'll get back on this perhaps next month. FELIX, I've started testing Asus P6T6 WS Revolution and seems with 21x turbo multi enabled, CPU Tweaker is SOMETIMES not all the time reporting 0mhz for frequencies. See screenshot below. I've included cpuz 1.51 dump here. FELIX, I've started testing Asus P6T6 WS Revolution and seems with 21x turbo multi enabled, CPU Tweaker is SOMETIMES not all the time reporting 0mhz for frequencies. Same problem in my Classified 759. I also have that problem intermittently on my P6T Dlx. and from time to time the cpu multi will read one higher as well, using 965XE. Also I add 2 timings: "B2B CAS delay" and "Idle Cycle limit" on Core i7 CPU. I have that problem too. It happens when some small info and tweak tools are running, not sure. But I'm sure that it always happens when Opera 10 is running. When I close Opera, CPU-Tweaker starts showing speeds. Just tried final ver 1.2 and it's not working, most of the times. One time it showed wrong bclk of 207.7, when it was 200. # memset 4.1 beta4 :- Add support for Intel Core i3 & i5 (Clarkdale) CPUs. (probably in the IGP include on the same package) this is why I use memset for this CPU. 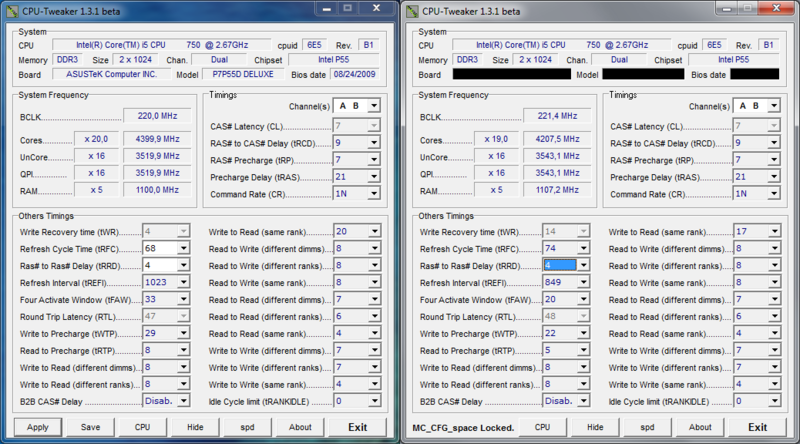 # CPU-Tweaker 1.3 beta1: -Add support for Intel Core i5 & i7 (Lynnfield) CPUs. Thank at Chri$ch for his help and tests. Last edited by FELIX; 09-04-2009 at 01:30 PM. Hi Felix. Memset 4.1B4 has a weird bug. This is how it opens after clicking exe. - If I set PL in column B and save then reopen it, it defaults back to this. =>gymenii: corrected in this version. DDR2 Memory frequency dosn't work for my two computers, there are only showed as 0.0 MHz! Where is the problem here??? all other timings are configurable from MemTest!? Last edited by StoleJova; 09-05-2009 at 01:39 AM. X58 does not work on Asus REX II on XP. There is no approval of the amendment ?? The requested URL /download/CPU-Tweaker12b8.zip was not found on this server. Last edited by marcin255; 09-05-2009 at 06:12 AM. Last edited by Chri$ch; 09-05-2009 at 06:15 AM. 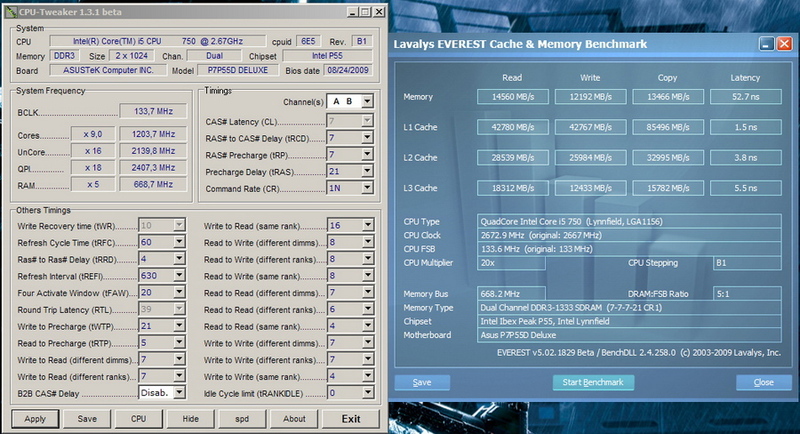 => StoleJova: is memset 4.0 read the memory frequency correctly? For "CAS# Latency (tCL)" and "Command Rate (CR)", is not possible to change these timings under Win. it's possible with GygaByte, eVGA ,DFI and Biostar motherboards. on some motherboards with lynnfield.The great news is Asus was decided to unlock it. => 3oh6: Just got your mail, thank. I let you know when the problem will be fixed. ...you can always send an email to Asus engeeners, but it's already do. Well, I don't know that, thanks! It's little confusing, options are enabled, combobox is working, but can't select anything - so I thought that something was wrong... Maybe it would be nice if that two options will be grayed and disabled (just suggestion)?! I see some BIOS allow enable or at least showing DIMM interleave aswell as RANK. I would like to see this, on my output, so I can if the BIOS not smart enough to enable it. if rank > 1 on DIMM, show Rank interleave en/dis., if paired DIMMs show DIMM interleave en/dis. In someone working on Asus Rampage Extreme II?